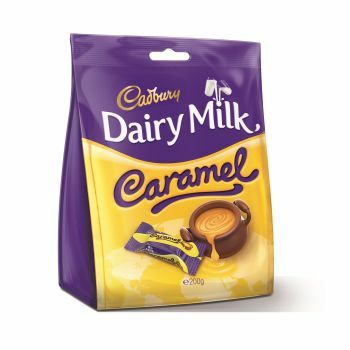 Discover the Cadbury Dairy Milk Caramel Chunks Bag, made up of 17 miniature chocolate bars with a caramel-filled centre. Rich caramel enrobed in smooth, delicious milk chocolate - a sticky, chewy experience that’s hard to beat! Individually wrapped for a convenient, grab-and-go treat, presented in a travel exclusive 200g snacking bag format.